I am a President’s Club top producer and have been in the mortgage industry for over 20 years. Regions® Bank offer more products than any other bank, which allows me to find the perfect loan for the client while providing top rated service throughout the loan process. I enjoy helping all clients with the biggest purchase most people make in their life. I am a Tampa Native and enjoy the lifestyle and community here. I volunteer in the community, to give back to an area that has been very good to me and my family. I am an avid outdoorsman and enjoy all aspects of our great community, from professional sports to golf, tennis and fishing. “One of the best home buying experiences I have ever had due largely to Derek.” – Randy R.
“I was very happy with my loan experience. 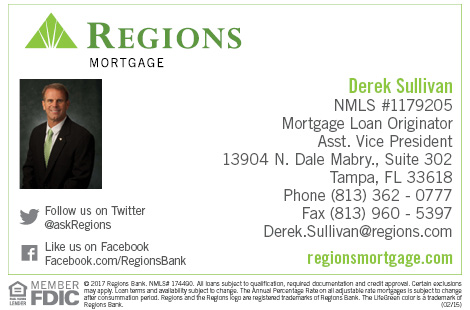 I would not hesitate to recommend Derek to others who may need the same services.”– Diana C.
At Regions Bank, our corporate values are not simply the values of a legal entity; they are values that reflect the ethics and commitment of more than 23,000 associates. Our values are a promise of how we will do business and serve the community. Regions believe in a simple philosophy. Put people first, Do what is right, Focus on the customer and always Reach higher to be innovative. Achieve excellence. Improve continuously. Inspire and enable others. Succeed the right way. Improve efficiency and effectiveness. You can always count on your Regions banker to give you sound advice to help you get where you’re going in life. There’s no such thing as a one-size-fits-all banking solution. That’s why we work with our customers to find the right answers for their individual needs.